I have received an email from Jeff Brown of Dynalloy, (one of the manufacturers of Nitinol and Flexinol). He asks me to point out that Flexinol is used in actuators. Nitinol is not suitable for actuators. Nitinol and Flexinol are also available as rod, tube, sheet as well as many other shapes and you should read the information on the company-website before making any decisions. The number of applications for this type of product are enormous. Nitinol is a SHAPE MEMORY ALLOY made of nickel and titanium that SHORTENS in length when current flows through it. Nitinol changes shape when heated but returns to its original shape when cooled. Nitinol requires a "retuning force" to return it to its original length after current has been turned off. It does not return to its original length by itself. A demonstration robot arm can be made with a short length of Nitinol and a few extra components as shown in the animation above. Nitinol is called Flexinol and possibly vise versa by the layman, but the two are not the same in performance. This website describes the two materials as equal but you should go to Dynalloy website to see the differences. Drill a hole in one end of each craft stick. Place the arms of the paper fastener through the two holes and bend them back to make the elbow joint, which should move easily. Bend each end of the Nitinol / Flexinol wire to form a loop and attach connectors by crimping to hold the wire in place. Make sure the connectors are tight enough to hold the wire loop in place. The loops will serve as attachment to the craft sticks. Use tacks to attach the loops to the sticks. 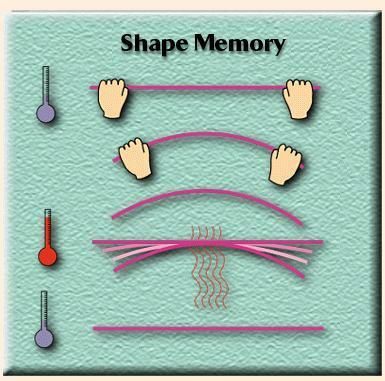 The Nitinol should be long enough to hold the sticks at a right angle when the wire is taut. Secure the upper part of the arm by clamping it to a structure so that it hangs perpendicular to the ground. Put enough coins a plastic bag to keep the wire taut and hang the bag from the arm. Connect the positive lead from the battery holder to the connector at one end of the Nitinol wire and the negative lead to the other end, via a switch. Switch the circuit on. Observe what happens when current passes through the Flexinol / Nitinol wire. Switch off and allow the wire to recover. Add coins to the plastic bag to see how much mass your robotic arm can lift. Intended for design and development engineers and students. Sleek silvery mylar wings flap silently using only five centimetres of Muscle Wire. Perches on you computer, annoys cats, amuses babies. Space Wings stands 15 centimetres tall and flaps up to 36 times per minute. Includes a printed circuit board, parts, & detailed instructions. Assembly requires soldering iron, solder, screw driver, wire cutters and two "AA" batteries. For ages 14 and up. A great first electronics kit & excellent hands-on introduction to electronic construction & Muscle Wires. Cost: $19.95 plus $4.95 postage. This is a fully functional electric valve made with Nitinol. It permits proportional control of the air or fluid flow. When voltage is applied the Nitinol inside contracts, opening the valve. These authentic-looking butterflies really flap their wings! The wings move once every two seconds, just like a resting butterfly. Just attach these butterflies to plants, picture frames, or your computer monitor. The wings move thanks to nitinol, the muscle of Stiquito. Comes with a 115v transformer and long cable. 30 cm long (1ft) Flexinol is great for experiments. The two sizes are also available by the metre for $10.00 per metre (incl post). Click HERE for a review with pictures. Read the first chapter of "Advanced Experiments with a Simple and Inexpensive Robot" by James M. Conrad and Jonathan W. Mills. Chapter 2 has detailed assembly instructions for constructing the Stiquito robot, so it looks like this is the best book to get. It comes with a Stiquito kit. Cost is $48.00 plus postage (for book and kit). Standard post is $8.00 If you are a member of IEEE Computer Society, the cost is $36.00 Click HERE to order. See details of the third book in the series: "Stiquito Controlled." It is written by James Conrad, and his website is: (http://www.stiquito.com). The book comes with all components to build the robot and is based on a Texas Instruments MSP430F1122 processor. The board will make the robot walk and comes with instructions to reprogram the board, to do other things. You can use the board for almost any application. The board is 3.3" by 0.75", and has a small prototyping area on it. For an example of a similar model (NITLEMITE) you can build yourself from Lego blocks, click HERE. World list of robotics info. Nitinol straightens out when heated. It can also be "trained" by shaping it within a flame to produce a new shape such as a square. It can then be bent to another shape when it is cold. It will return to a square when placed in hot water. Livewire is a fun little toy. According to the directions, you place it in cold water, bend the wire into any shape you want, then place it in hot water and the wire pops back into shape. 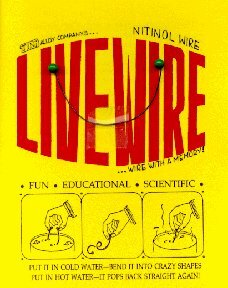 Livewire toy is made of nitinol wire with a low transition temperature (the temperature of hot water). When placed in hot water the wire will unfold and unbend itself (if bent out of shape), reverting back to its original shape. Nitinol fun products can be purchased HERE. Contraction time is directly related to current delivered. The guidelines above are only approximate, as other factors such as ambient temperature, air currents and heat-sinking will alter the value. Page 2 covers the characteristics of Nitinol.